We'd all like our own Wardrobe Consultant but if you follow a few basic steps you can do it just as well by yourself. We all need to take control of our closets from time to time - at the start of a new season; or perhaps it's getting more difficult to find everthing in the morning. Or - perhaps you've just had your colors analyzed and want to think about co-ordination with a new color swatch. try on, appraise and decide whether it's IN or OUT. Sort through your trousers and skirts. If you're currently wearing them and you know they fit and flatter you they're back IN. Do the same for jackets and cardigans - these will co-ordinate with the bottoms. Separate any suits so that you can make more outfits - if they fit and you feel happy with them they're IN. Work logically through the rest of your items: shirts, blouses, t-shirts, tanks etc. these are the important LINK items that tie the tops and bottoms together. Important items to be IN. A quality garment that doesn't fit could be altered - evaluate whether it's worth the expense and whether you like it enough to both - RECONSIDER. Wardrobe looking a bit bare? 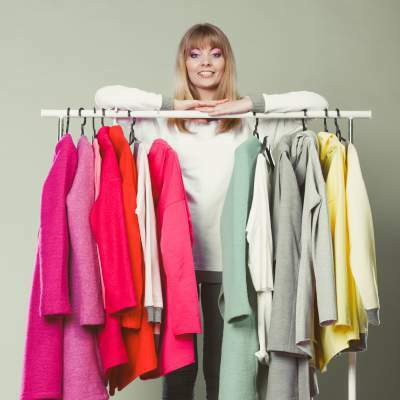 If the wardrobe looks a bit bare now, don't worry, you've managed the first step as a Wardrobe Consultant so give yourself some credit. It's better to have a few things that look good, fit and flatter you than to have a wardrobe full of clothes that do nothing for you - and that you never wear! Next you'll be ready to go forward step by step and fill in the gaps with things that DO work!